My dad used to make the best popovers in a big popover pan that takes up tons of cupboard space. I don’t have one of those and not to worry if you don’t either. 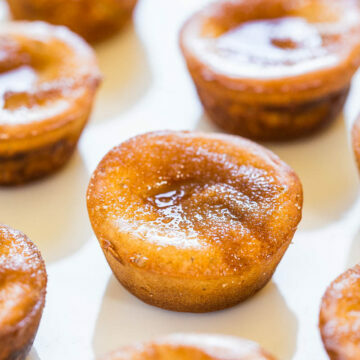 The popovers are made in mini muffin pans, much more common than popover pans. 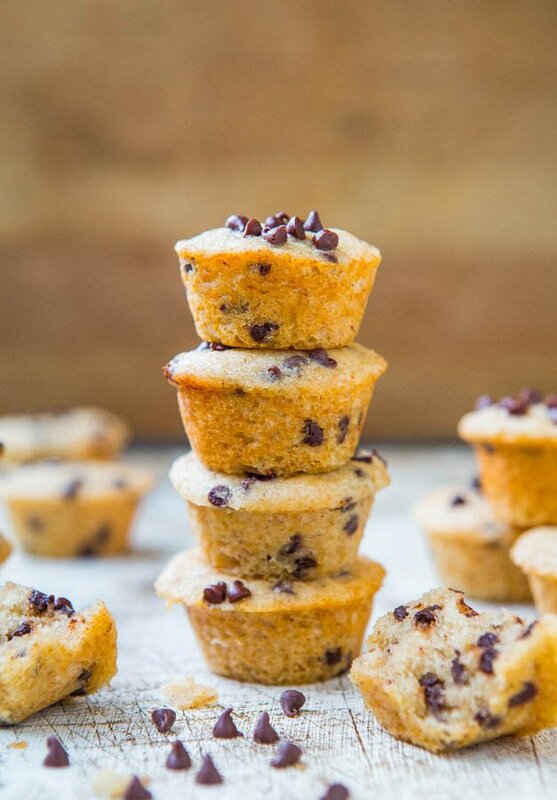 I haven’t tried the recipe in a regular-sized muffin pan because I have a fondness for mini muffins and love the texture and cute factor of mini things. But I’ve read about people having good luck with regular muffin pans. 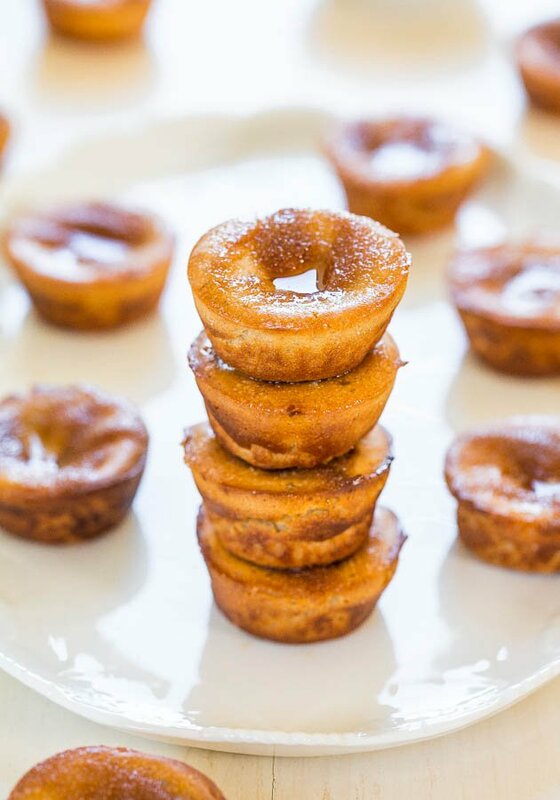 The popovers remind me of cinnamon-sugar mini donuts and that’s a beautiful thing. Warm, carby bread that’s drenched in melted butter and topped with cinnamon-sugar cannot be bad. The batter is beyond easy because you simply combine all the ingredients in a blender. I love blender batters. It’s important to let the batter rest for about 15 minutes to give the flour time to absorb some of the liquid. The resulting popovers taste better and have a better texture. The popovers bake in a 450F oven for 10 minutes before reducing the heat to 350F and baking until they’re done. Don’t open the oven door to check and see how the popovers are doing. The high heat creates puffier popovers and you don’t want any hot oven air to escape. The recipe makes about 2 dozen mini popovers and although I wanted to keep them all for myself, I put half the batch into a Dixie Quicktakes® for my daughter’s teacher. 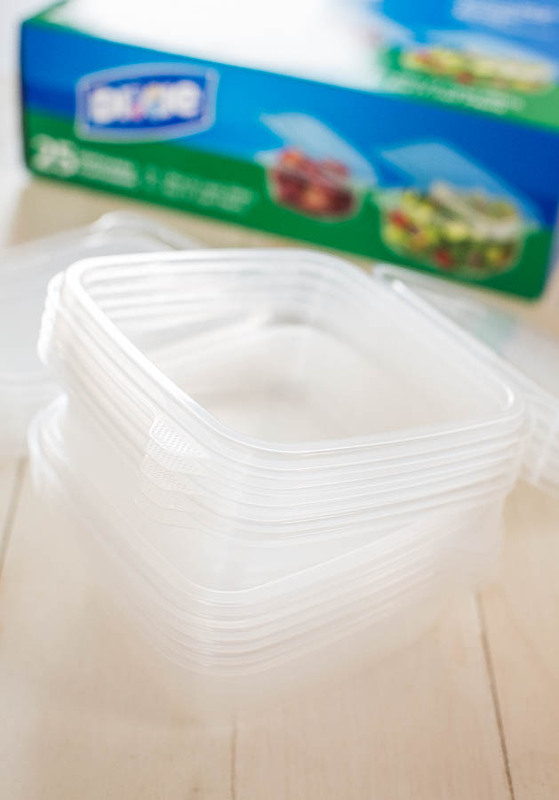 Quicktakes® have attached lids so you’re never going to misplace the lid, they’re dishwasher and microwave-safe, and are inexpensive so I don’t mind giving them away. I remember the days of my mom asking neighbors for her re-useable containers back which isn’t a concern with these. The popovers are soft, slightly chewy, and full of rich vanilla and cinnamon-sugar flavor. I used vanilla unsweeetened almond milk which helped boost the vanilla flavor. Mini food is so poppable and the mini popovers were no exception. One after another, down they went. I felt like a kid again at the state fair eating mini donuts. And I loved every buttery, sugary bite. The popovers remind me of cinnamon-sugar mini donuts and that’s a beautiful thing. 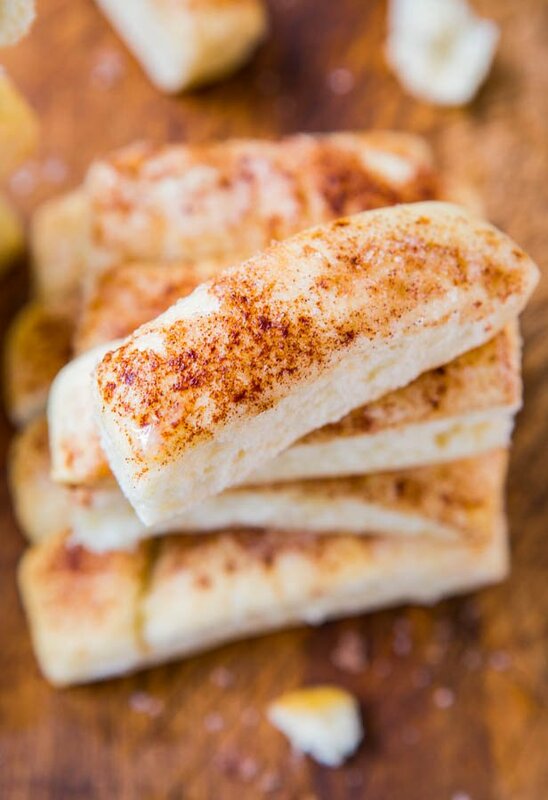 Warm, carby bread that’s drenched in melted butter and topped with cinnamon-sugar cannot be bad. 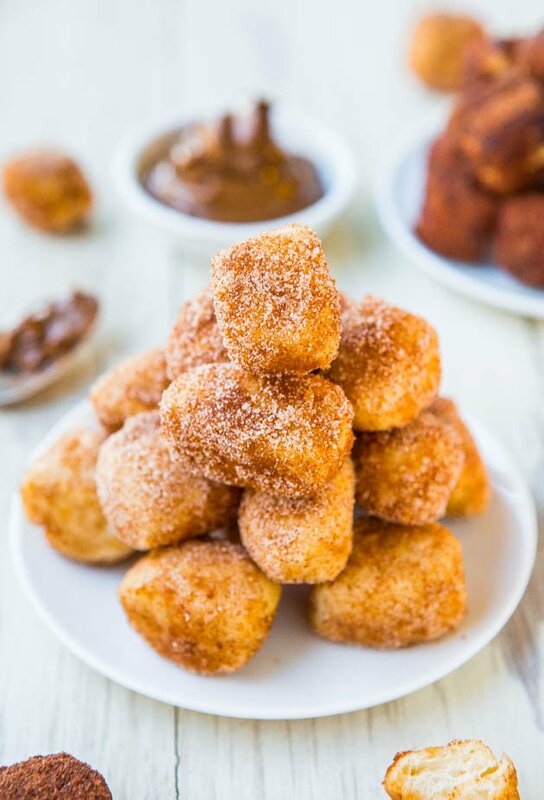 They’re soft, chewy, and full of rich vanilla and cinnamon-sugar flavor. The batter is beyond easy because you simply combine all the ingredients in a blender, noting resting time of 15 to 20 minutes. Bake in a 450F oven for 10 minutes before reducing the heat to 350F and baking until done. Do not open the oven door to check on the popovers, but watch them very closely at the end through the oven window so they don’t burn. 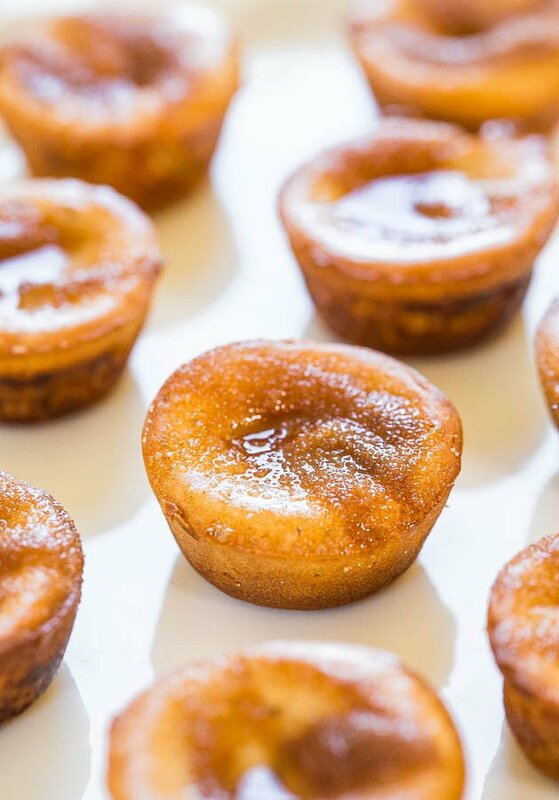 I brush popovers with melted butter and sprinkle the tops with cinnamon-sugar, but you can dunk them in butter and then toss in cinnamon-sugar for a fully coated effect. Batter – To the canister of a blender, add all batter ingredients and blend until smooth and combined, about 90 seconds on high power. Allow batter to rest in blender canister for about 15 to 20 minutes while oven preheats. Resting allows the flour to absorb some of the liquid and popovers taste better and have a better texture. Preheat oven to 450F and spray a mini muffin pan(s) or a popover pan very well with floured or non-stick cooking spray. 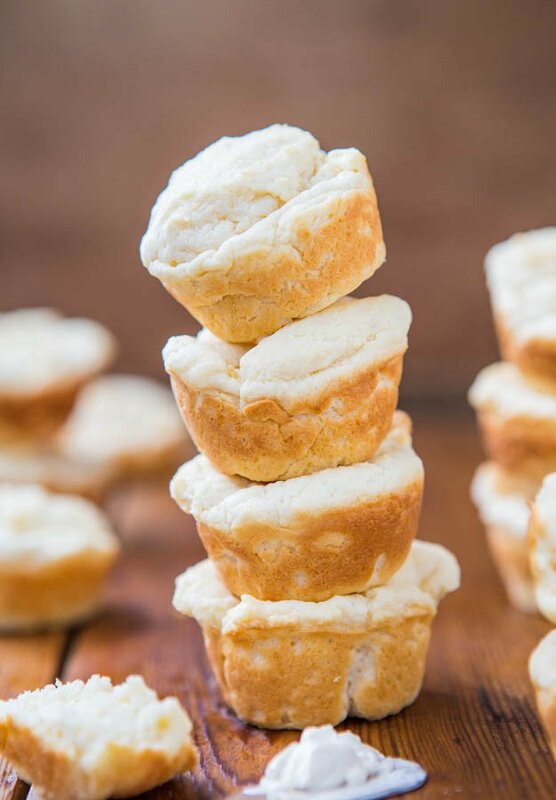 I haven’t made recipe in a full size muffin pan (or traditional popover pan) although many people use muffin pans as a substitute for popover pans with good success. After batter has rested, quickly blend for about 15 seconds to fluff it up. Divide batter equally among the cavities in prepared pans, filling each between half and two-thirds full. Bake for 10 minutes at 450F. Do not open the oven door at any time. The high heat creates puffy, domed popovers and you don’t want any hot oven air to escape. Reduce heat to 350F (don’t open the oven) and bake for about 4 minutes, or until popovers are domed, puffed, and golden browned. Watch them very closely at the end through the oven window so they don’t burn. While popovers are baking, make the topping. Topping – Place butter in a small microwave-safe bowl and heat on high power to melt, about 45 seconds; set aside. In a separate small bowl, add the sugar, cinnamon, and stir to combine. After taking popovers out of oven, keep them in the pans, and brush evenly and generously with melted butter. You will likely have extra butter, but after about 15 minutes, the first coating of butter soaks in. Alternatively, you can submerge popovers in the butter, and then toss to coat in the cinnamon-sugar mixture so the whole popover is coated rather than just the top. If you’re doing that, you’ll need at least double cinnamon-sugar. Using a small spoon, sprinkle the tops evenly and generously with the cinnamon-sugar mixture. Remove popovers from pan (use a butter knife to dislodge if necessary although after the butter brushing, this is unlikely) and serve immediately. Popovers are best warm and fresh but will keep airtight at room temp for up to 4 days. Reheat for 10 seconds in micro if desired. This post was brought to you by Dixie Quicktakes®. Recipe, images, and all opinions expressed are my own. I want those bars of yours today, that top layer looks so luscious, dense, thick…my perfect bar! 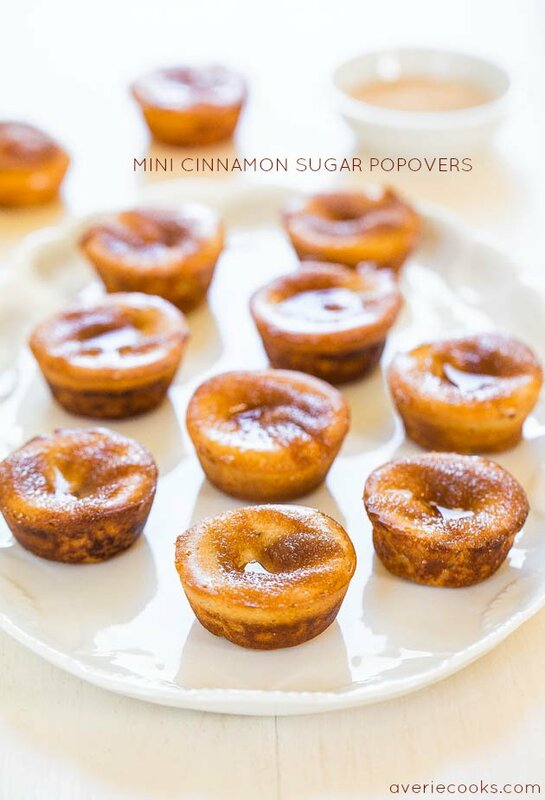 LOOOOVE these adorable, buttery, sweet mini cinn sugar popovers!!! Loving these sweet little bites of goodness! No fancy pans is always a plus! Pinned! These are SOOO cute, Averie!! Can’t believe I haven’t I thought to cinnamon sugar my popovers before. Perfection!! Holy Yum… now this looks like something that is perfect to munch on for breakfast, lunch, or dinner. Popovers are so addicting, love the cinnamon sugar twist Averie! Gorgeous pics too! Thanks for the photography compliments, Krista! haha i just bought those quicktakes on amazon a couple weeks ago! i love them because i’m always giving away leftovers to my friends and neighbors! so funny that you use them too!! 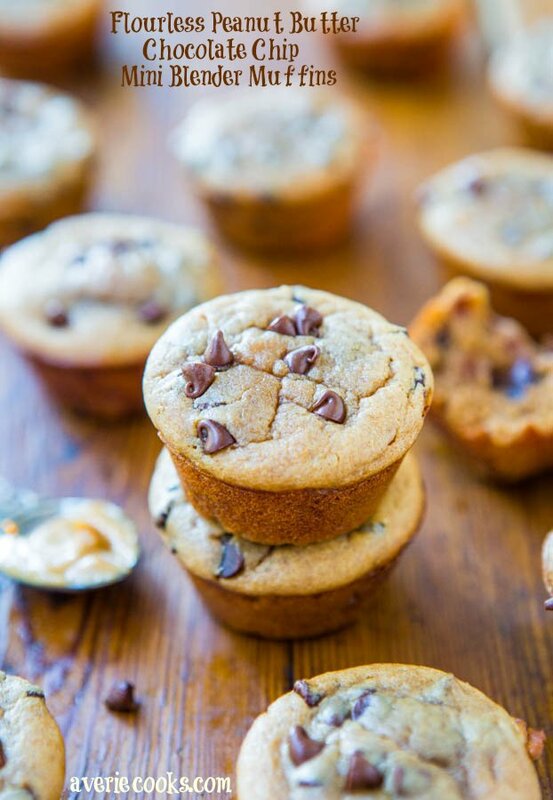 can’t wait to try this recipe…pinning! These are so cute and your photography makes them all the more tempting. Will definitely be trying out this recipe. Thanks for the inspiration! These look so irresistible! I’m sure I’d have no probably popping 10 of them! I love that they are mini. I love so much about these…1. they’re mini 2. they’re sweet 3. a blender! They are a total must-make…pinned!! Thanks for the pin love and the compliments! These look and sound absolutely amazing! this is just beautiful!!! How is middle suppose to come out? Just made these delicious little things, but they are chewy and gooey and almost undercooked? The tops came out perfect and I didnt want to overcook the tops. My kids still loved them anyway! If they were gooey, that means they were a little on the underbaked side. There is a fine line of overbaking the tops and underbaking the center so next time just bake a bit longer and I think you’ll be all set. Glad you kids loved them! Wish I had these for breakfast this morning! Mini things always taste better! Partially because I don’t feel so bad taking seconds (and then sneaking thirds and fourths…). All that cinnamon sugar goodness looks incredible. I’m such a sucker for cinnamon!! Great post, as always, Averie! I ended up ordering the Quicktakes too. Can’t wait to fill mine up with some of your delicious recipes and share with friends! Mini food is ALWAYS the best, and these are no exception. They look completely addictive! I tried these tonight and they didn’t turt. ItThe consistency is weird. The batterally water when I finished blended so I added a few tablespoons of flour. I also let the batter rest for about 20 mins, but still really watery. They look delicious though! If your batter was watery, then I don’t think it was quite right…not sure what brand you use or how you measured it what exactly happened. I use King Arthur brand all-purpose flour and blended in a Vita-Mix. Thanks for trying the recipe. 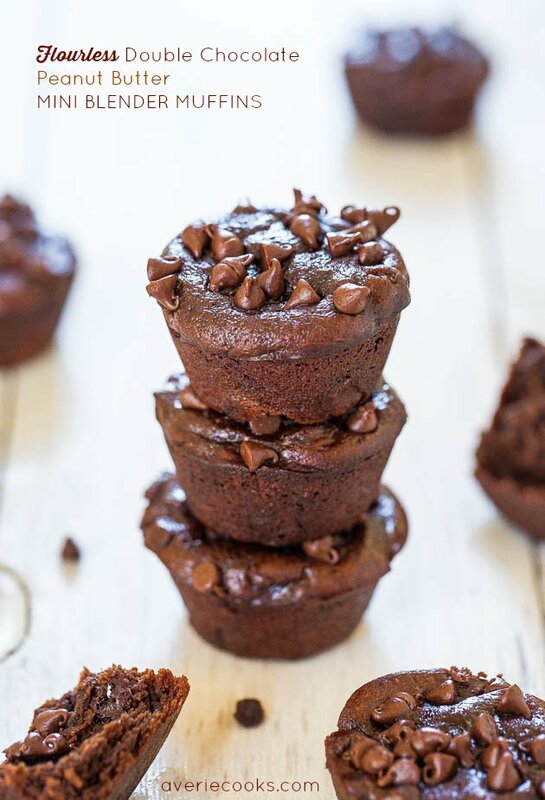 I am dying to try these … but I only have regular muffin tins! How much of an adjustment on time would you guess I’d need to make? Since I’m not supposed to peek in the oven … your guess may be better than mine! Gosh I really don’t know! I’d add at least an extra 5 minutes, but I am not sure…you’d be better off peeking if you have to, than either under/over-cooking them. Good luck! Could I make a couple batches ahead and freeze them? Take em out the night before eating them? They look great and I have a busy summer ahead. Little time to bake or cook. I want to make breakfasts ahead of time. TIA! I made these last night and loved them! I’ve never had popovers before so I was a little surprised at the texture but they were delicious. They actually reminded me of a hand held bread pudding! Definitely making again ?